Soon, we might be trading missiles for lasers. If all goes as planned, we may not have to travel to a long time ago in a galaxy far far away to be on a planet where epic laser battles occur. 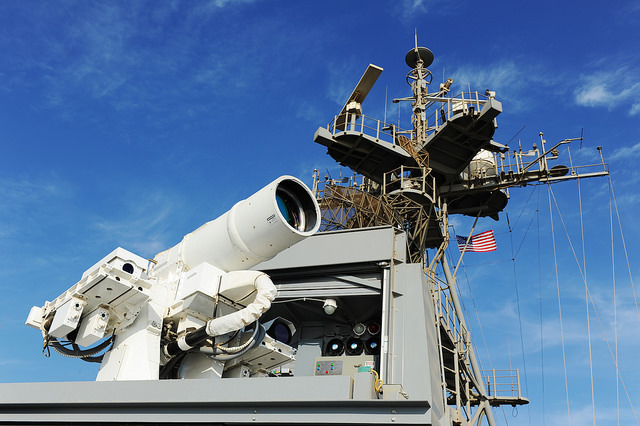 In addition to the Laser Weapons System (LaWS) that has already been developed for use by the United States’ Navy, more powerful laser guns are currently in the works. These weapons are being crafted for deployment on Naval destroyers, cruisers, and aircraft carriers to take out enemy targets like drones, aircraft, ships, and even incoming missiles. The Office of Naval Research is working with Northrop Grumman on developing systems to test this emerging laser technology. A press release from Northrop explained, “The company will design, produce, integrate, and support the shipboard testing of a 150-kilowatt-class solid state (electric) laser weapon system.” Though a timeline is not in place, officials are excited at the potential of these futuristic weapons. And, since they won’t deliver on pop culture’s promise of “pew-pew” and bright lights, well…at least these lasers are cost effective. According to Guy Renard, a director and program manager at Northrop, “For about the price of a gallon of diesel fuel per shot, we’re offering the Navy a high-precision defensive approach that will protect not only its sailors, but also its wallet.” The current incarnation of this technology can fire off a single round that only costs about $0.59 cents per shot, as opposed to the thousands or millions of dollars that missiles cost American taxpayers.